While perusing the blogosphere and some of my favorite interior design mags over the past few months, something has begun to stand out to me – the hot pink sofa. The infusion of pink in interiors has been growing ever since Honeysuckle was named Pantone’s color of the year in 2011. While accessories are usually a great way to bring bright color home, it’s even more exciting when large color blocks are brought in through furniture. From Elle Decor to Better Homes and Gardens, the hot pink sofa is becoming a key accessory in the most modern and even the most traditional of interiors. Here are a few of my favorite images featuring this design trend. I absolutely love the sweet pink settee against the back wall in this dining room. The silver gray wall color is a perfect color complement. Pink can look amazing in a modern interior. In this living room full of heavy wood accents, this modern pink sofa brightens and updates the room. The shade of pink has some depth to it, so it’s not too sweet, but deep enough to be placed with the warm brown tones in this room. Hot pink velvet? Yes! I love how classic this room is. The dark cherry pink sofas are a fabulous way to inject some unexpected color and texture into this formal living area. Once you find some pink upholstery fabric that you love, you can use it on a new sofa, or as a way to update an old one. 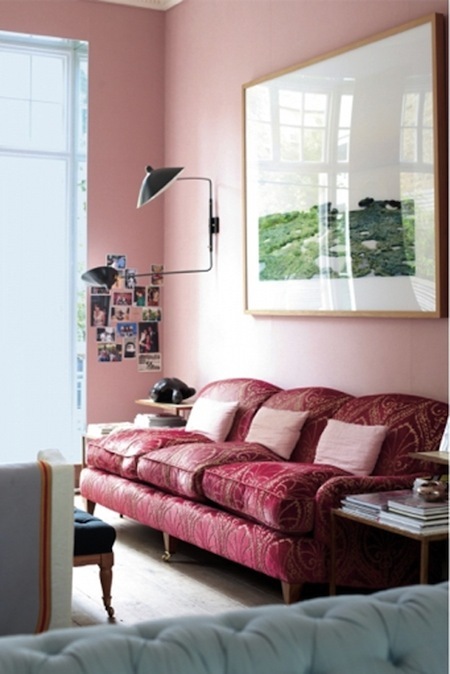 I love how this vintage sofa is brought into the 21st Century with some fabulous pink upholstery fabric. So, what do you think about this design trend? 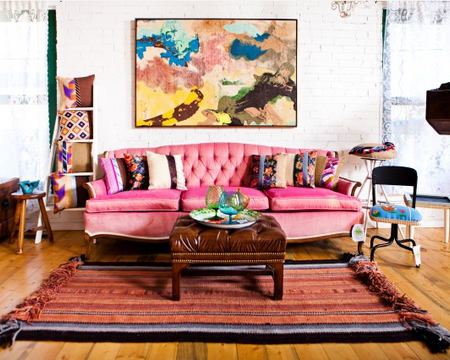 Do you think these sofas bring in too much pink, is it too girly girl, or a fun way to bring a splash of color home? Pinterest Love: Suzanne Dimma of Canadian House & Home’s Kitchen Happy Weekend & The City Paper!